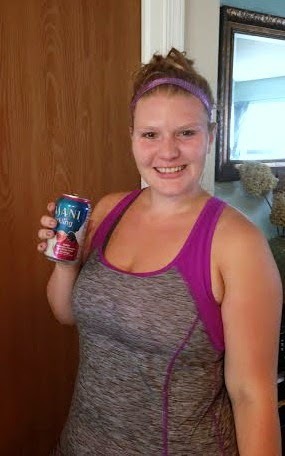 How I #SparkleWithDASANI and Zumba! Since I've started my fitness journey and have been losing weight I have cut out all regular soda products. Regular soda has WAY too many calories to be worth drinking! However, I still do like drinking something besides plain water everyday so diet soda and flavored water products have been a nice treat for me. I was excited to get to try out the new DASANI Sparkling flavored water beverages for a new beverage treat. With 0 calories per serving and the refreshing flavors of berry, lemon, lime and apple, these sparkling cans of water were a hit for me!! Because the new DASANI sparkling waters are fun, fresh and (most importantly) sparkly, DASANI had to do something awesome to celebrate....and what could be more awesome than winning a FREE trip to Florida?? That's right! DASANI is giving away a free trip to Ft. Lauderdale Florida for you and three friends! It's SUPER easy to enter. All you have to do is upload a picture of what makes YOU sparkle to twitter or instagram with the hastage #SparkleWithDASANI. Be sure to follow @dasaniwater so they can contact you if you win! That's it! DASANI wants to know what makes you sparkle in your everyday life: your kids, your hobby, spending some "me" time getting a manicure, whatever it is just snap a pic and upload it to twitter with the hashtag for a chance to win the free trip! I entered the contest with this picture hubby snapped before I left for the gym, because going to ZUMBA makes me sparkle!!! PLUS two 50-minute spa treatments per guest. Sounds amazing to me!!! For more info on the contest go here and don't forget, just use hastage #SparkleWithDASANI when you upload a photo to twitter or instagram of you doing what makes you sparkle!